One interesting thing that I have noted with my grandchildren over the years is that when they were just playing, they just didn't CARE if the scale was right or not. Their imagination allowed them to use anything and everything, happily mixing furniture and everything else in "their" dollhouse and out - blocks and sticks and stones and film canisters; dolls, animals and action figures of all sizes; with plastic hamburgers bigger than the baby in the crib. 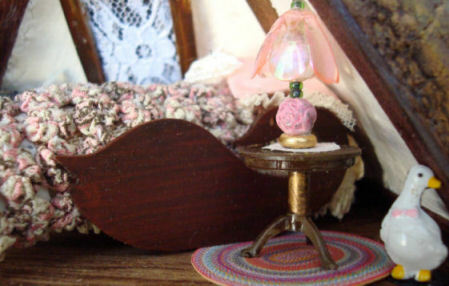 They learned early, however, that their grandmother's dollhouses and roomboxes and domes were "something else," and accepted quite readily that the only one who played with them was their grandmother! And from the youngest age when they did a project with me, they shifted into another mode and became aware of scale. They realized that what we did together was "something else," too. Doing a Project With Nana is also another aspect of play but with different parameters, where a kind of logic is required, however whimsical the subject. There have also been times when they insisted on using something that Nana might not have chosen, but since it was THEIR project, I did not quibble. I think I have been two people with them - the "real" Nana, who reminds them to wash their hands before dinner and to make their beds while they are here, and the "other" Nana, (whom you all know, as well lol) who traipses off in her imagination and talks to a teeny tiny snail one minute and a skeleton the next, and they never batted an eye at the mixing of scales in THAT fashion. On the other hand, I often selectively mix items from different scales, and when I do, they understand the logic of it because they have the Mini Eye. For instance, when I was working on my 1:24 Mother Goose's cottage, I used the 1:48 BPF (brown plastic furniture) dining table in the bedroom as a side table, and the BPF white pitcher in the kitchen as well. In fact, I have used both pitcher and bowl in 1:12 scale, too; for instance, the bowl for a tiny African violet on a bedside table, and both of them painted and placed inside a curio cabinet, etc. I have also used various Chrysnbon glassware pieces, too, for 1:48 scale; both the white and the colored, mainly as bowls, urns, planters and large display plates. In fact, in real life I have a very large cup and saucer (made as a gift for me by a former assistant principal who relieved stress by making pottery). It works great to hold chile con queso and chips, and when not in use can sit atop a kitchen cabinet for display. I have duplicated that idea in 1:12 scale with overly large inexpensive pieces; the same idea could work in 1:48, too. I have also painted pieces of 1:12 scale silverware brown to look like wood for 1:48 wall display pieces like those that were popular in the 70s. In fact, I duplicated my mother's large wooden scissors display hanging over her sewing machine, painting a pair of 1:12 scale scissors brown and adding tiny sprigs of flowers. I have also used picture frames both as frames and to make tray tables. In the old days when we used to visit the markets in Juarez (no more! ), I picked up everything small that I could find. Tiny clay, wood and straw birds and figures; pottery; tinware; copper bowls, jugs and pitchers; small glass pieces that I watched being made right in front of me; yarn Ojos De Dios (God's Eyes); wee serapes and sombreros; leather boots, etc. For years I have found uses for those pieces here and there, in various scales, not always in SW scenes, either. A colorful painted plate works well as wall art; a cup filled with tiny apples and pine cones looks neat in a Christmas setting. Some of those copper pieces appear also in Mother Goose's cottage, now that I think about it, although that is 1:24 scale. Each time I go for a doctor's appointment, if I am not too exhausted afterward I go prowling for Cheap Thrills. The other day I was in Hobby Lobby and was stunned to see, standing upright in a rack on the wall, porcelain plates just like the ones my friend Pat's mother used to paint. The shading and painting of the roses was exquisite. Up close, of course, I realized I was looking at beautiful sturdy paper plates! Don't we often say that in miniatures everything is illusion? It occurred to me that if I could use paper plates to suggest china ones in miniature, I might try the same thing with those sturdy paper plates in full size. I came home and stood one dinner plate and one dessert plate upright in the groove in my china cabinet and lo and behold through the glass doors they looked just as real as the real ones in there! I made a whole slew of miniature waffles back in the 80s on a very inexpensive waffle iron - the kind that was in a cellophane package, hanging on the wall with the dollhouse stuff in Ben Franklin. This was after a Fimo workshop where we were supposed to be making fruit. I had been trying to make purple grapes, and kept adding this and that - wound up with great eggplants and plums, but no passable grapes. Anyway, as I kept folding in more transparent it looked sort of streaky and I thought, hmm, that looks like meat. Wound up with great steaks, roasts and even hamburger and bacon, but no grapes! And by the way, I suggest experimenting sometimes by adding paint and bits of odds and ends to different puddles of glue and stir. You find all sorts of things that you didn't know you were looking for when it dries. I accidentally spilled a lot of glue once, fortunately on wax paper, and because I hated to lose it all and was bored with what I was already doing anyway, I separated it into various puddles and added dots of color, and the fine crumbs from the bottom of a potpourri package, new coffee grounds, model railroad apples and oranges, whatever I could find, etc. When dried, and cut into squares like fudge or rolled into balls or sticks, or thinly sliced, I had all varieties of candy and didn't waste all that spilled glue! Sometimes now when I have a bit of dried glue left on my work area I roll it into little balls and use it to clean up bits and pieces of stuff. Usually, it looks awful, but sometimes it doesn't. 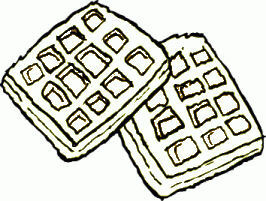 So, remember Wanna's Life Lesson: Just because your goal is grapes, it doesn't mean you won't find bacon and waffles!